If you are new to annotation in Java, then this article will give an exciting example to understand what Annotation actually means in Java. 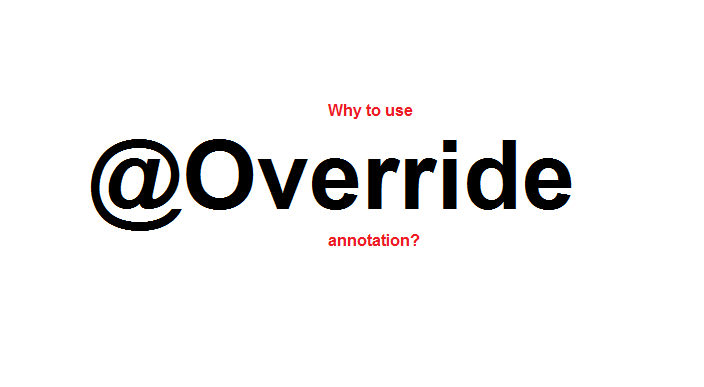 We'll also understand what is Annotation and why we need them with one example of @Override Annotation. This snippet of code was expected to call the setSalary() method of the Manager class but the output does not show the expected result. You put comments indicating your intention to override the method in the Manager class. However, comments do not stop you from making logical mistakes. You might spend, as every programmer does, hours and hours debugging errors resulting from this kind of logical mistake. Who can help you in such situations? Annotations might help you in a few situations like this. The use of the @Override annotation did the trick. The @Override annotation is used with a non-static method to indicate the programmer’s intention to override the method in the superclass. At source code level, it serves the purpose of documentation. When the compiler comes across the @Override annotation, it makes sure that the method really overrides the method in the superclass. If the method annotated does not override a method in the superclass, the compiler generates an error. In your case, the setSalary(int salary) method in the Manager class does not override any method in the superclass Employee. This is the reason that you got the error. You may realize that using an annotation is as simple as documenting the source code. However, they have compiler support. You can use them to instruct the compiler to enforce some rules. Annotations provide benefits much more than you have seen in this example. You can remove the @Override annotation from the setSalary(int salary) method in the Manager class. It will make the method an overloaded method, not a method that overrides its superclass method. Note that the @Override annotation in the setSalary() method of the Manager class saves you debugging time. It lets you associate (or annotate) metadata (or notes) to the program elements in a Java program. The program elements may be a package, a class, an interface, a field of a class, a local variable, a method, a parameter of a method, an enum, an annotation, a type parameter in a generic type/method declaration, a type use, etc. In other words, you can annotate any declaration or type use in a Java program. An annotation is used as a modifier in a declaration of a program element like any other modifiers (public, private, final, static, etc.). Unlike a modifier, an annotation does not modify the meaning of the program elements. It acts like a decoration or a note for the program element that it annotates. An annotation serves this purpose. It is human readable, which serves as documentation. It is compiler readable, which lets the compiler verify the intention of the programmer; for example, the compiler makes sure that the programmer has really overridden the method if it comes across a @Override annotation for a method. Annotations are also available at runtime so that a program can read and use it for any purpose it wants. For example, a tool can read annotations and generate boilerplate code. If you have worked with Enterprise JavaBeans (EJB), you know the pain of keeping all the interfaces and classes in sync and adding entries to XML configuration files. EJB 3.0 uses annotations to generate the boilerplate code, which makes EJB development painless for programmers. Another example of an annotation being used in a framework/tool is JUnit version 4.0. JUnit is a unit test framework for Java programs. It uses annotations to mark methods that are test cases. Before that, you had to follow a naming convention for the test case methods. Annotations have a variety of uses, which are documentation, verification, and enforcement by the compiler, the runtime validation, code generation by frameworks/tools, etc. An annotation does not change the semantics (or meaning) of the program element that it annotates. In that sense, an annotation is like a comment, which does not affect the way the annotated program element works. For example, the @Override annotation for the setSalary() method did not change the way the method works.